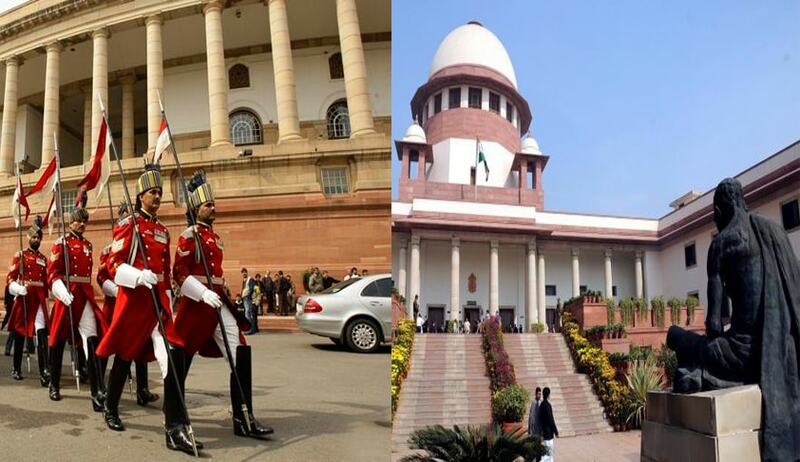 Stalemate Over NJAC: Is Presidential Reference A Way Out? On October 16, the first anniversary of the Supreme Court’s landmark judgment in the National Judicial Appointments Commission (NJAC) case, went completely unnoticed in the legal circles and in the media. The reasons are not far to seek. The judgment, although a landmark in India’s jurisprudence on separation of powers, has still left many questions unresolved. One of these is how to ensure that the Collegium system, entrusted with the responsibility to shortlist and recommend candidates for Judgeships to the high courts and the Supreme Court, functions in a transparent and efficient manner, to the satisfaction of all the stakeholders concerned. The imbroglio over the finalisation of the Memorandum of Procedure (MoP) by the Government and the Collegium, is a manifestation of lack of agreement between the Executive and the Judiciary on the implications of the NJAC judgment, and the consequent judgment on the reform of the Collegium, delivered in December 2015. It is possible that the differences would be ironed out and the new MoP would indeed become a reality in the next few days. But the distrust underlying the process of finalisation of MoP between the Executive and the Collegium, has led some to question the very understanding of our Constitutional scheme by the Supreme Court in terms of its various decisions. One such question concerns the very location of sovereignty. It is all right to say that all the three organs, namely, the Executive, Judiciary and the Executive, are supreme in their respective domains, and the Constitution has inherent checks and balances, in order to prevent one from encroaching the other. One answer to this question is that the Indian Constitution rests the sovereignty on the people of India. But this answer is too general, to be of use, to understand. Questions can again be posed as to how the people exercise this sovereignty, apart from periodical adult franchise, at the time of elections to Lok Sabha and the state assemblies. Absence of any provision to hold referendums, in our Constitutional scheme, to decide key issues, is likely to further complicate this issue. Despite frequent exhibition of inclination by the judiciary to fill the void, created by the legislature and the executive, to alleviate the suffering of the people, or make the institutions accountable, and to monitor compliance with its orders from time to time, courts are by and large restrained in their response to pleas for directions to executive or the legislature. The recent example is the Supreme Court’s dismissal of a public interest litigation (PIL) petition seeking guidelines to codify the privileges of Parliament and state legislatures - a dismissal, which again went completely unnoticed in the media. The petition, filed by advocate, Neela Kedar Gokhale, on October 17, sought codification of powers, privileges, etc. of the Houses of Parliament and of the members and committees thereof, under Article 105 of the Constitution, to prevent abuse of immunities enjoyed by Members of Parliament. The petitioner argued that what is uttered in Parliament, leads to violence outside; therefore, there is need to frame guidelines. The Supreme Court bench, comprising justices J.S.Khehar and Arun Mishra, however, dismissed the petition because the petitioner has other remedies. “It is not in our domain”, Justice Khehar noted, while agreeing that it is right time somebody like the petitioner, sought action by the authorities concerned. “The initiative has to come from within”, the bench observed, while advising the petitioner to pursue alternative remedy. But judicial restraint has never been the guiding principle, when the matter hinges on judicial independence. The NJAC case a recent example of the Court not ceding an inch to the Executive to have a say in the appointment of Judges to the Higher Judiciary. In two other recent cases, the Court expressed its disagreement when the counsel pointed to limitations within the Constitution itself over the scope of judicial review. In the Arunachal Pradesh case (Nabam Rebia v Deputy Speaker and others), the Court refused to read Article 163(2) of the Constitution - despite its express and clear language - as putting any fetter on the scope of judicial review of the Governor’s discretion. Again, in the very recent Cauvery maintainability case, which the Court heard and reserved its judgment, last week, the bench comprising justices Dipak Misra, Amitava Roy, and A.M.Khanwilkar, was not inclined to agree with the Attorney General that Article 262 of the Constitution, a original provision, ousts the Supreme Court’s jurisdiction, from hearing appeals against the final orders of the Cauvery Water Disputes Tribunal. Put in this context, an article by the former Principal Secretary, and Adviser to the former Prime Minister, Manmohan Singh, T.K.A. Nair, has put forward the proposition that the Central Government should invoke Article 143 of the Constitution, and make a Presidential reference to the Supreme Court, to seek clarification, and to trigger an informed national dialogue on all facets of Constitutional issues, involved in the developments leading to the NJAC verdict. According to him, a Presidential reference is necessary to ensure appreciation of the spirit of the Constitution and its restoration in the functioning of the legislature, the executive and the judiciary. If at all the present Government thinks of making such a reference to the Supreme Court, the Supreme Court, hopefully, will keep an open mind, and examine its merits. The Government, too, must frame the right issues in such a reference, even if it has to concede to the Collegium, on the MoP, in the meantime. Even if the questions posed in the Presidential reference, and the answers expected from the Supreme Court are academic, they will be helpful to understand our Constitutional scheme better than what we have been able to, so far.